Above the altar of the Sistine Chapel, Michelangelo’s “The Last Judgement” dominates this jewel of European Renaissance art. Over 300 figures, nearly all men, are judged, many of them cast down into the fires of hell. Well, supposedly the majority of Europeans no longer believe in hell, but it seems the President of the European Council is not one of them. 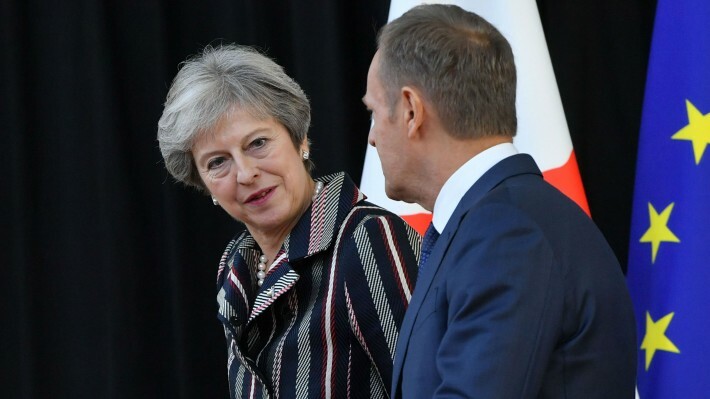 Donald Tusk channeled his inner Dante Alighieri, updating the great Italian writer’s warning above the gates of hell to: “Abandon all hope, ye who exit here.” For, in the former Polish prime minister’s fevered imagination, he has “been wondering what the special place in hell looks like, for those who promoted Brexit without even a sketch of a plan how to carry it out.” Perhaps Tusk puts them at the bottom of Dante’s nine circles of hell, the ninth one being associated with treachery. Tusk had backing. Guy Verhofstadt, the European Parliament’s chief Brexit negotiator, tweeted back: “Well, I doubt Lucifer would welcome them, as after what they did to Britain, they would even manage to divide hell.” More face-palming comedy moments followed in the form of all the lazy ripostes from certain British Brexiteer politicians, who badmouthed Verhofstadt as an unelected politician — the lowest of the low in Brexit-speak. This enabled the Belgian to retort that more than 500,000 people voted for him. The tabloid media is, as ever, little better in its misguided fury. The Sun feigned outrage, conveniently forgetting its own classic headlines, such as “EU dirty rats.” The European Commission got so tired of all the myths propagated by Britain’s newspapers — such as the EU banning curvy bananas, wanting to ban noisy toys, or forbidding kids from blowing up balloons — it set up its own myth-busting website. It takes remarkable chutzpah for Brexiteers to mount their high horses about language and being rude, having traduced the EU for decades. If one ignores the brazen undiplomatic gaffe and its decidedly unhelpful consequences, do Tusk and Verhofstadt have a point? During the referendum campaign, the leading Brexiteers sweetened the offer of leaving the EU with a range of promises worthy of snake oil salesmen. Chief of these was the lie emblazoned on the side of a bus that Britain gives £350 million a week to the EU, which, if the UK left, would be spent on the National Health Service. This ignored, amongst other things, the £100 million a week Britain gets as a rebate. Every constituency and group heard the dreamy promises they wanted, and many will be disappointed. Anything to win the vote perhaps, but one might have imagined zealous ideologues might have a plan up their sleeve. But, more than two-and-a-half years since the referendum and less than 50 days until the UK crashes out of the EU without a deal, and Brexiteers still cannot agree on the best way forward. Not one leading Brexiteer even bothered to try and disprove Tusk’s statement that they had no plan. Yet their Remainer opponents cannot conjure up a way to stop them. Planning for a no-deal Brexit is not hitting the heights either. Exhibit A for any future Hollywood movie would be the hiring of a ferry firm that has no ferries and now does not even have a port. Yes, the government has axed its deal with Seaborne Freight to transport food and medicine in the event of a no-deal exit. Trade Minister Liam Fox had promised 40 trade deals prior to Brexit, but so far can only boast agreements with Chile, Israel, Switzerland and that economic colossus, the Faroe Islands. British voters may not have been too impressed either at the slothful image of Members of Parliament finishing halfway through the afternoon last Wednesday. Crisis. What crisis? The reality is that the government will not trust Parliament to vote on anything substantive at present for fear of losing another vote or having it ruthlessly amended. Tusk deliberately or ill-advisedly highlighted the increasing frustration amongst EU figures. He did not apologize for his comments and officials made clear he was just expressing his views. Some EU officials increasingly cannot wait for the huge relief when Britain leaves. The UK may be paying a long visit to purgatory and could be on its very own highway to hell. Dante might recognize a few of the seven deadly sins at play during the Brexit process, with anger increasingly dominant and cool heads a rarity. For outsiders, there is certainly not much to envy.